We offer a number of additional services. These can be applied in the basket. 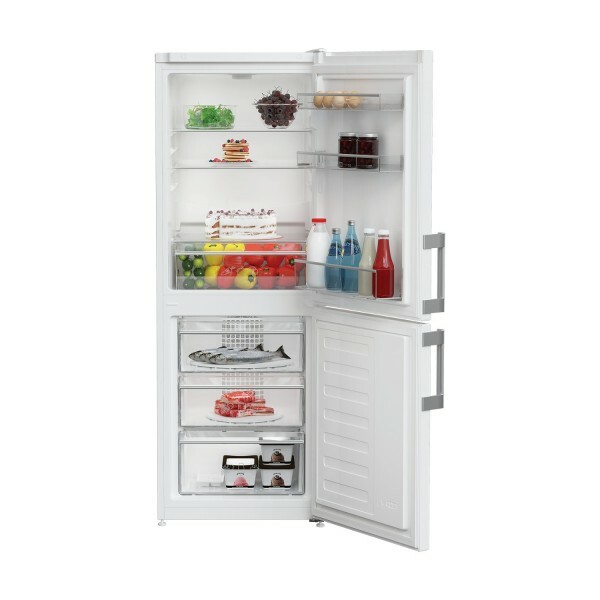 Product information "Blomberg KGM4530 55cm Frost Free Fridge Freezer in White"
If you’re after an energy efficient fridge freezer with plenty of storage options for your chilled and frozen food, look no further than the white, freestanding KGM4530 from Blomberg, exclusive to Euronics and Agents stores. Sometimes it’s hard to find the time to do your bit for the environment. The KGM4530 does this for you by delivering excellent results without wasting energy. It’s been awarded an A+ efficiency rating, which means low running costs and savings on your energy bills. Manually defrosting your fridge freezer is a difficult process, and can mean a lot of food going to waste. Luckily, you’ll never have that problem with the KGM4530. Its frost free technology helps maintain the optimum temperature. 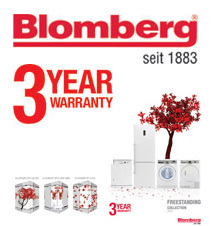 Blomberg’s FoodProtector technology means the fridge freezer can be stored practically anywhere in your home. It’ll operate perfectly at temperatures as low as -15°C, so you can keep it in your garage. This fridge freezer has antibacterial door seals to help prevent the spread of germs - perfect for the hygiene conscious consumer. The reversible door feature also makes for left or right hand opening, allowing maximum flexibility for installation. The upper section stores all your chilled goods. The fridge has three sturdy shelves, which are made from transparent glass. This makes it easy to find what you’re looking for. The team at Blomberg has made great use of the available space by adding door storage shelves. One of these contains a dairy compartment for cheese, butter and other essentials. There’s also a large salad crisper that keeps the freshness locked in your fruit and vegetables. The three large freezer drawers are perfect for storing everything from whole chickens for your Sunday roast, to indulgent desserts. The drawers are made from durable see-through plastic to keep your items safe, and allow you to see what’s stored in each one. There’s a slimline ice storage tray too – perfect for making ice cubes for chilled drinks. Related links to "Blomberg KGM4530 55cm Frost Free Fridge Freezer in White"
Customer review for "Blomberg KGM4530 55cm Frost Free Fridge Freezer in White"